Did you know there are more than 2,400 homebuyer programs available across the country? In fact, they can be as unique as the homebuyers and communities they serve. Homebuyers should investigate these financing options early in their home buying journey. They include loans, grants, tax credits and other programs for eligible homebuyers that can help them achieve the down payment faster, cover closing costs and get into a home sooner than they would have otherwise. State Housing Finance Agencies (HFA) often offer the broadest array of opportunities. Cities and Counties offer programs with criteria adjusted for local median income and home prices. What are common requirements to qualify? Both the home and the homebuyer must be eligible. Homeownership programs are for owner-occupant buyers only, no investment properties. Buyers must make a minimum investment, qualify for a first mortgage and complete homebuyer education. Common eligibility factors include home sales price, homebuyer income and homeownership history. There are often additional benefits, or even entirely separate programs, for educators, protectors, health care workers, veterans and households with disabled members. Do you have to be a first-time homebuyer? HUD defines a first-time homebuyer as someone who hasn’t owned a home in 3 years. Plus, across our databank of programs, 37% don’t have a first-time homebuyer requirement. These programs are normally soft second or third mortgages or grants, providing benefits such as 0% interest rates, deferred payments and forgivable loans. The assistance amounts will range from a few to tens of thousands of dollars and can be used towards closing costs, prepaids, principal reductions and/or repairs. Restrictions are most commonly income (based on household size) and sales price limits which vary by city or county. Don’t count out high cost markets. Program benefits and eligibility requirements are adjusted based on the area’s median income and home prices. Homebuyers purchasing a home in a target area designed by the housing finance agency may receive special benefits such as higher assistance amounts, more lenient income requirements and if there is a first-time homebuyer requirement, it may be waived. Many larger housing finance agencies, particularly at the state level, offer first mortgages to accompany their down payment assistance program(s). These first mortgages typically offer a below market interest rate, and may even have reduced closing costs or reduced fees. They are often funded by state housing finance agencies and may subsidize portions of the interest to offer effective rates below what the normal market can provide, helping to lower buying costs and monthly payments. The USDA also has two first mortgage programs that we include in DPR for each county, where applicable: the Rural Direct Loan and the Rural Guaranteed Loan. Both loans are primarily used to help low-income individuals or households purchase homes in rural areas. Funds can be used to acquire, build (including purchase and prepare sites and provide water and sewage facilities), repair, renovate or relocate a home. These programs allow financing of up to, and sometimes more than, 100% of the selling price with no mortgage insurance requirements. This annual federal income tax credit is designed to help first-time homebuyers offset a portion of their mortgage interest on a new mortgage as a way to help qualify for a loan. Because it is a tax credit and not a tax deduction, mortgage lenders will often use the estimated amount of the credit on a monthly basis as additional income to help you qualify for the loan. The amount of mortgage credit allowed varies depending on the state or local government that issues the certificates, but is capped at a maximum of $2,000 per year by the IRS. 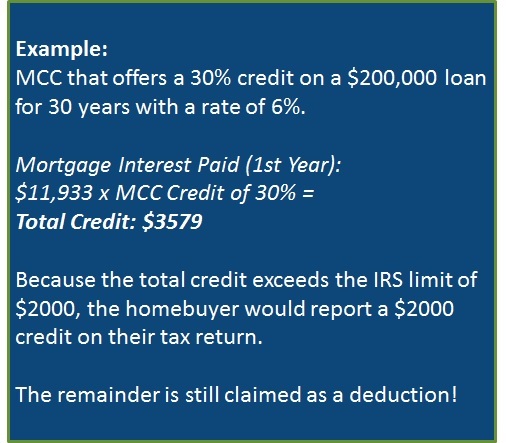 As an example, if a homebuyer were to receive an MCC that offers a 30% credit on a $200,000 loan for 30 years with a rate of 6%, the allowable tax credit would be figured as follows (all numbers rounded). Because the total credit in this example exceeds the IRS limit of $2000, the homebuyer would report a $2000 credit on their tax return. The buyer may continue to receive a tax credit for as long as they live in the home and retain the original mortgage. Find your state’s Housing Finance Agency website and search for available programs. View the agency’s list of participating mortgage lenders and call a few until you find one that you’re comfortable with. You can use Down Payment Resource to get matched to programs that are a fit for your personal situation. Want more details? Watch our recorded webinar about down payment program basics. To find out which programs are currently funded and available to you click here.